During the time time of Selcuk Empire and before they came to Anatolia, Turks reigned or Iran (Persia) and caucasus for several centuries. 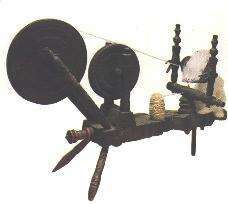 The art of weaving was introduct to Anatoly by the Selcuks toward the end of the 11th. and the begining of 12th. centuries whwn Selcuk sovereignty was at its strongest. 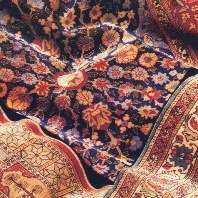 In addition to numerous carpet fragments, many of which are yet to be documented, there are 18 carpet and fragments which are known to be of Selcuk Origin. The technical aspects and vast variety of designs used proves the resourcefullness and the plendor of Selcuk rug weaving. The oldest surviving Selcuk carpets are dated from the 13th.-14th. centuries. Eight of these carpets were discovered in the Alaeddin Mosque in Konya (capital of Anatolian Selcuks) in 1905 by Loytred, a member of German consulate staff, and were woven at some time between the yaers 1220 and 1250 at the appex of Selcuks reign. Of these 8 striking rugs, 3 are large complete rugs; 3 are large fragments from small rugs, and 2 are fairly small fragmants originating from large rugs.three more carpet fragments from the Selcuk period were discovered in 1930 in the Esrefoglu Mosque in Beysehir. Today, these rugs are displayed in the Mevlana Museum in Konya and the Kier collection in London. A third group of carpet remmants were recovered in Fostad (old Cairo) in 1935-1936. These 7 rugs from Fostad were identified as having originated in Anatolia in the 14 th. 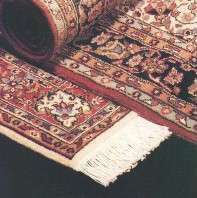 century.the most common design characteristic of the 18 rugs before mentioned are the Kufic border, the eight pointed star, and the hooked (geometric) motif. The Turkish rug, which originated in Central Asia, preserved all of its characteristics until the 14th. century. After the Ottamans gained control over the whole Anatolia, changes began to appearing the composition of the field, in the characteristics of the motifs, and in the sizes of the still traditionally woven Turkish rugs. During the Ottoman reign, Several Turkish tribes decided to settle down and built a number of villages and small towns. Notably, the village of Hereke was settled on the edge of Marmara Sea some 60 kilometers east of Istanbul. 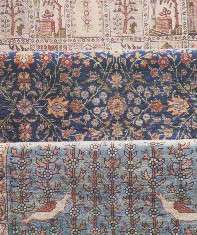 The first court carpet workshop was established in Hereke and began to weave carpets of unusually large sizes to be used in decorating Ottoman palaces. These exceptionally fine rugs were also used to tie and retie relationships with Europian countries in time of war and peace and so they were given as gifts to kings and queens, as well as to key army commanders and statesmen. Towards the end of the 14th. century, these rugs which were the finest examples of the eye and hand harmony, began to enter European homes, churches and castles thans to intermediaries such as merchants Florance and Genoa. During the 14th., and 16th. centuries, Turkish rug designs apperead prominantly in many European artists' paintings, with the rugs so depicted being of Anatolian origin. These paintings were subssequently named for the respective artists, for example, Holbein, Lotto, Memling, Van Eyck, etc. In the begining of the 16th. century, every European prince owned a private carpet collection. (Herman Haack, Echte Teppich- Eastern Rugs). In Vienna, the people were allowed to own rugs after 1671. When the Turks left Vienna, many Turkish rugs were left behind in their tents. This allowed fine Turkish carpets to become known by the Europian populace. A short time thereafter, the kings and queens of Europe began to open their castles and palaces, as well as their residences, to visitation by their subjets. This in turn, spurred European interest and thereby dramatically increased the demand for hand-knotted Turkish carpets. In the 19th. century, additional court workshops were opened in Istanbul in the districts of Kumkapi, Topkapi and Uskudar. And in 1891, Sultan Abdullhamid II increased the number and sizes of the carpet workshopps in Hereke, and thus, the exquisite carpets woven in Hereke became more plentifull. Throughout their development- from Central Asia to the Caucasus region to the Anotlian plains, steppes, and costal areas, and through the Selcuk and Ottoman eras Anotolian rugs have maintained the purity and caracteristics of their origin. Turkish court rugs were originally influenced by sources brought ander Turkish control, but which were modified Turkish standarts and requirements. Thus, Turkish rugs reached their deserved place in Europe. Rugs from Hereke, Usak, Bergama etc. became well known and kind increasing in demands continiuing to increse with time. Anatolian rugs are unbelievably rich in desing, color and symbols. Today, these fine rugs are woven in more than 750 villages and tribal (namadic) areas. Each of these rugs differs from each other by their particular desig, symbolism, and relative size; these caracteristics are passed on from mother to doughter, and thus for centuries they have kept same design, symbols, and beatiful shades of colour.